Eternal Treasures | "Seek first the Kingdom of God and His righteousness…"
Rather than “the look” of death, God invites us into what I will call “the look” of life. This look brings salvation. For the unbeliever this look is the look of faith that brings salvation from sin and new life. For the one who is saved it can bring renewal of life and fellowship with God. For the downcast it brings salvation from our despondency. For the discouraged it sweeps away our despair and brings life-giving hope. For the lonely it brings the comforting presence of God. For the hurting it brings the sweet relief of our hurts. For the grieving this look invites the peace of God. Salvation belongs to the Lord! When we look to the Lord with the look of faith He is there and ready to meet us where we are in life. This look is not for a select few, but there is a universal invitation to look to the Lord. It’s not just Israel that is able to look, but the invitation is for everyone. The gates are open. The path is clear. The way of salvation is made straight. The means of salvation is defined. 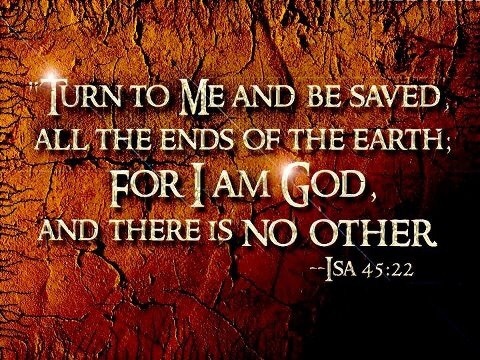 Look to the Lord all you ends of the earth and you will be saved. You don’t have to be rich to look. You don’t have to be good looking to look. You don’t have to dress a certain way. Just look! God loves it when we humble ourselves and look to Him with the look of faith. But why should we look to the Lord? Why not look to someone else? Why not cast our gaze in another direction? There is no question that we often do these very things. We often look in the wrong direction and to the wrong person or people. We often misplace our trust is material and temporal things to save us. However when we look the Lord we are looking to the One who is Lord of our circumstance. In fact, our circumstance passed through His hands before it ever entered our existence. So why wouldn’t we look to Him? Why wouldn’t we trust Him? After all, He is God and there is no other. This look of faith is grounded in the sovereign Lordship of our creator. We can trust Him…so look and live today! daily have I known the strength of the Spirit, my teacher, director, sanctifier. Indeed it does. 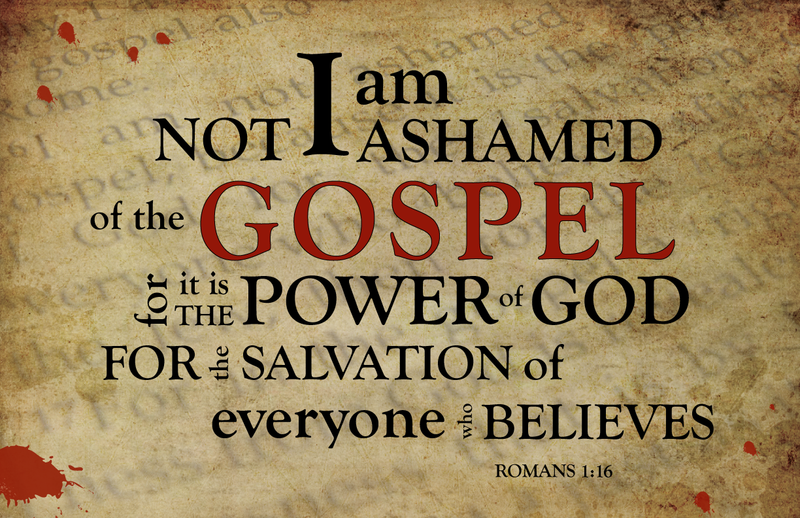 “For I am not ashamed of the gospel, for it is the power of God to salvation to everyone who believes” (Romans 1:16). “For the word of the cross is foolishness to those who are perishing, but to us who are being saved it is the power of God” (1 Corinthians 1:18). Let’s meditate on that phrase, the power of God. I think my heart is cold to it. I think I’ve lost the sheer awesomeness of what that must entail…the power of God. The power of God is on display around us. Certainly we can see the power of God all around us in creation. God spoke the world into existence (Genesis 1). God only has to speak and His power is on display, not just in that moment, but continuously for all to see. Certainly this power of God in creation goes beyond what we see in our immediate physical realm…it extends into the vastness of the universe to place where mankind attempts to see, but even then we are limited. God’s power is not only on display around us, but also beyond us. We have made vast discoveries in the universe, but we’ve only begun to scratch the surface of what God in His power has created. The power of God is on display in us, that is in all human beings. Psalm 139 is a masterful declaration of the power of God at work in the womb of a woman as God weaves together the various parts of a human being and creates life. This power is on display everyday in our world. It’s happening in every pregnant woman on the planet. Furthermore, the power of God is on display every time you and I look into a mirror and see ourselves. Yes, what many, maybe even the majority nowadays, chalk up to evolutionary chance, the Scriptures declare as the handiwork of God. That’s you and me, God’s handiwork! But for the believer in Jesus Christ the Bible tells us that there is yet a more powerful display of God’s powerful working at hand. Yes, there is a special grace that is at work today in my life and in yours if you know Jesus as your Savior…it is the power of God in the gospel at work in us. You see, it is a gross miscalculation that we make if we say that once we’ve believed that we are done with the gospel and the gospel is done with us. A thousand times, NO! The gospel is the power of God unto salvation for the believer, and did you catch what Paul said in 1 Corinthians 1:18, the gospel is the power of God to us who are being saved. That’s right…on that Sunday in January of 1991 the power of God saved me, but practically speaking it began saving me. It is at this moment saving me. The power of God will be saving me right up until that moment when it finally delivers me into the presence of Christ and I am forever free from the presence of sin. There is unspeakable power at work in we who believe right now. I think this must speak to a couple of things about you and me. The power of God in the gospel must speak to just how weak and powerless I am by myself. How utterly sad we are that we are not strong enough to deliver ourselves and yet this true, we are in a sad and weak condition. It always takes a great deal of humility for anyone of us to come to God and confess that we are weak. I was too weak to save myself before I met Christ and I am too weak to keep myself saved now. Yes, I need Him. The power of God in the gospel must also speak to just how sinfully depraved I am in my rebellion against God. Oh, how wicked I was before I met Christ, and if it were possible that Christ were to abandon me today and leave me without His power I know that I would be even more wicked today. We humans have a great propensity to underestimate our sinfulness…to gloss over our sin. We do this through many avenues of self-justification and comparing ourselves to others who in our minds seem worse than us. However in doing this we also greatly diminish our ability to see the greatness of the power of God in the gospel to deliver us. Aren’t you glad that God sees us exactly how we are and still extends grace in the power of the gospel? I know I am. Think about it: the power of God is at work in you and me right now, delivering us to the end. The gospel is not not done with us Christians, and we are not done with the gospel. It is the power of God unto salvation for those of us who are being saved. Let’s yield to His power in us today.